When it comes to investing, how often do you allow your emotions to make decisions for you? If you are like many investors, the answer is probably more times than you think. Sadly, when we allow our emotions to make decisions for us, we usually end up making the wrong choice. This is most true when it comes to investing. In order to make money investing, you need to stay invested for the long term. Unfortunately there is confusion with the statement, ‘stay invested for the long term’ on two levels. Let’s break this statement down into two parts and look at each one independently. First we have ‘stay invested’. This means you need to be invested in the assets you choose to invest in. It does not mean you sell when things get scary and the market drops and buy into another mutual fund or ETF. It also doesn’t mean you sell out of one investment and buy another because the new one you found is going to offer you a better return. You pick your investments and you stay invested in them. You can buy more as time goes on (and you should) but you don’t sell when times get tough or when you find a sexier investment. Next we have ‘for the long term’. What exactly is long term? Unfortunately, there is no defined period of time for the long term. This is because each investor has his or her own goals and time horizon. While long term for me might be 30 years into the future for retirement, long term might mean 40 years for you if you are also saving for retirement and are younger than me. It could also be 10 years for someone saving for their young child’s college education. The point is, the phrase, “for the long term” simply means to stay invested until you need the money or something drastic changes ñ which is not the market dropping. I’ll address “something drastic” shortly. So when we put these together, we see that we need to stay invested in the investments we chose and hold them until we reach our designated time horizon. But what if we don’t? What if we get scared and move to cash when the market is dropping, promising to invest again when gray skies turn blue? In theory this is great. In reality it is flawed thinking. This is because no one knows when the market will drop or rise. It could crater 500 points today. What will it do tomorrow? What about next week or next month? Your guess is as good as mine ñ we both have no idea. Below is a great chart from Blackrock who is the firm behind iShares. As you can see, missing just 10 days in the stock market can cost you big time. 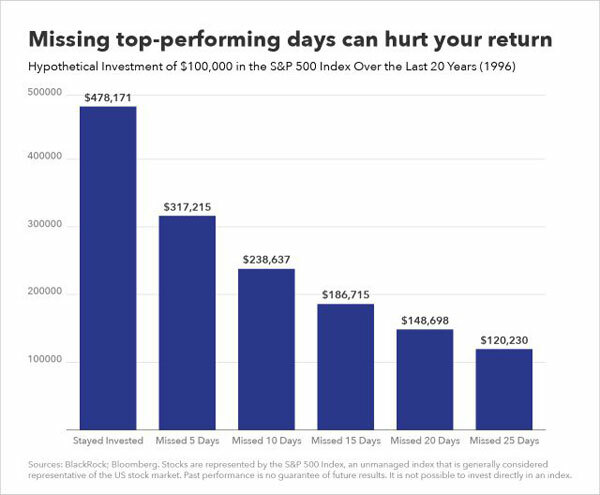 The crazy thing is, is that we never know when top performing days will come. Many times after a big selloff, the market rebounds. Just look at the recent turmoil with Brexit. Within 4 days of the crash, the stock market was higher than it was before. If you had sold out in fear, you lost money. If you stay invested, you made money. Same thing with the collapse in 2008. By 2011 the stock market had recovered most of what it had lost. But many investors never came back until later, and some are still on the sidelines. Had you stay invested, you would be sitting pretty right now. In order to have the most success investing, you need to pick an asset allocation that works for you and have a plan regarding why you are investing as you are and what your goals and time horizon is. When you do this, you can sit back knowing that the investments you are investing in are right for you. From there, you only have to work on your emotions. When the market falls, try your best to keep things in perspective. The market drops all of the time and it comes back all of the time. Stop watching the news and reading horror stories on how the world is ending online. Realize that this is just a bump in the road. If that isn’t working, think about this: Wall Street makes money on trading fees and commissions. How do they get this money? By having you buy and sell all of the time. If everything is good, you most likely won’t be buying and selling. But if the market is dropping and your hear all sorts of news stories about how bad it is, you likely will react and sell. In other words, you are playing into their hands. The media is to blame too. Hyping news stories gets eyeballs and readers which means they can charge more for advertising. They are both out to get you. You need to know this and do your best to keep your emotions in check. If you can do this, you will be able to stay invested for the long term and see success as an investor.